"One of the most spiritual things you can do is embrace your humanity. Connect with those around you today. Say 'I love you', 'I'm Sorry', 'I appreciate you', 'I'm proud of you' whatever you are feeling. 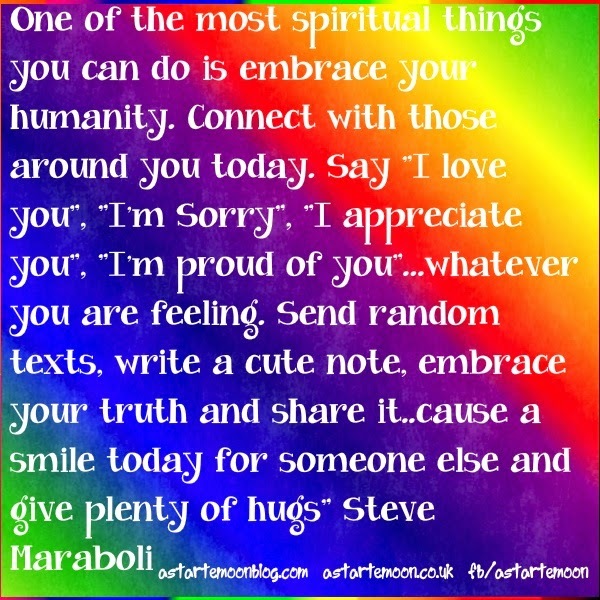 Send random texts, write a cute note, embrace your truth and share it..cause a smile today for someone else and give plenty of hugs"
Another wonderful quote from the amazing Steve Maraboli. I love his words he speaks such simple truths that we all know in our hearts yet sometimes forget to follow. This is an easy one to do, such a simple thing to tell someone you love them, send a text, write a note, leave a post it on the fridge or a note in a lunch box. Practice random kindness! It is simple and easy to do yet you will make that person's day. And hugging, you cannot underestimate the power of a hug. It has been scientifically been proven to increase seretonin and decrease the signs of ageing apparently so hug as many times as you can throughout the day! Connecting with others in this way will remind you of your own gratitude for their presence in your life, reminding you of the way their lives enrich your life. We are all part of this wonderful web of life and can embrace it with all our hearts.